The destinies of Ora Ciega, the religious relic, and a rookie detective merge into a fateful trip into the hills above Mexico’s Costa Chica coast south of Acapulco. In a lonely place where vigilante groups have replaced civil authority and the crash of surf competes with gunshots, Emilia will face the biggest challenge of her police detective career. But it’s nothing compared to the shocking climax waiting for her back in Acapulco. 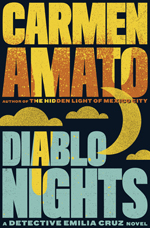 In DIABLO NIGHTS, senior detective Franco Silvio is back as Emilia’s reluctant partner. Also making a reappearance is Victor Obregon Sosa, the enigmatic head of the police union for the state of Guerrero whom Emilia finds both attractive and dangerous. There’s always someone new in the lieutenant’s chair, however, and this time it’s one of their detective colleagues who isn’t coping well with the job. Emilia needs to step carefully around him, but it’s a lesson she’ll learn too late.